TidyTabs is a useful application that makes it possible to organize your programs as a single tabbed group as an effective access method. You can access the program by hovering your mouse over the top left corner of any open window. 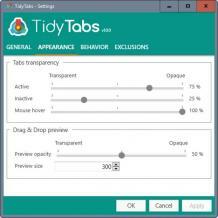 TidyTabs perfectly integrates with your Windows system and works like a default feature. The application doesn’t have an actual interface but you can access its Settings pane from the system tray. From there, you can change the visibility of active and inactive windows but also for the mouse hover. Furthermore, it is possible to set the app to show a tooltip when the name is too long, as well as hide fullscreen tabs or single tabs among others. The desktop can be organized by creating custom groups of apps. Also, TidyTabs can automatically detect the applications which do not need tabs, plus you can define apps which should be included or excluded under the tabbed group using its Whitelists and Blacklists.